Most of us have had our fair share of disagreements with others on line. Especially in today’s world of social media, it has become much easier to post your opinion, or even get into a quick “Twitter war”, and scroll past. But not for Donald Trump, he tackles his Twitter opposition by blocking them, and doing so has landed him in some hot water. This past July, the Knight First Amendment Institute, and seven individuals, filed suit in the Southern District of New York against President Trump. These seven individuals were blocked by the president’s Twitter account, @realDonaldTrump, and have filed suit to argue that the president and his communications team is violating the First Amendment by blocking individuals for criticizing the president, or his policies. The Knight Institute formally filed suit in after not receiving a response to a letter they sent to the president in June requesting that he unblock users, and setting the legal basis for a potential lawsuit. 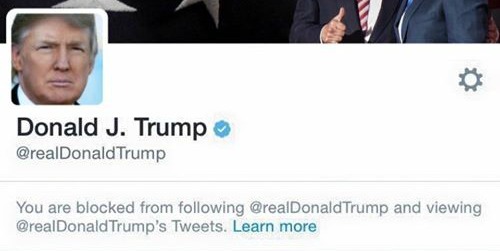 Late September, a legal brief from the Trump Administration acknowledged that Trump’s decision to block Twitter users from seeing his tweets is based on his response to criticism. The White House is fighting this lawsuit, claiming that the president’s account is personal, and not a government publication. If this is so, plaintiffs cannot invoke a First Amendment right. The Knight Institute disagrees, and argues that President Trump’s account is a form of government speech, much like a federal website, since the President uses it to announce major news or policy decisions. Still, the plaintiffs must persuade a court that @realDonaldTrump is a government account. Considering that the account is open to the public, and a public official discusses official public policy through it, it seems as though it is a government account. Additionally, White House Social Media Director has access to the account, and occasionally posts messages to that account as well as to @POTUS, and @WhiteHouse. When a Twitter user is blocked from another’s account, they are unable to interact directly with the person who blocked them, or view their account, and vice versa. Therefore, those who are blocked from Trump’s account are unable to participate in threads and conversations that are open to others. Arguing that they are directly unable to see the news that President Trump has tweeted out, or respond directly to the comments on the @realDonaldTrump account, the plaintiffs contend that this act by the President is simply an illegal form of viewpoint-based discrimination, and violates a person’s right to engage in political dialogue. Previous Can Taylor Swift Shake This Off?